You want to watch Wimbledon, but you missed the ballot and there’s no way you’re joining THAT queue. Nor are you willing to spend your days indoors, glued to a TV screen, when the sun’s a-shinin', birds are a-singin' and there’s Pimm’s ready for a-drinkin'. Luckily, certain London establishments are on hand with a giant screen — and possibly a deckchair or two — to give us a front row seat from which we can fully admire all those magical Wimbledon moments between 27 June-10 July. Watch the action from the roof on One New Change. Details below. Strawberries and Screen pops up in Granary Square showing all the action on a big screen, with strawberries, Pimm's and other refreshments available to buy, so you can feel like you're really in SW19. 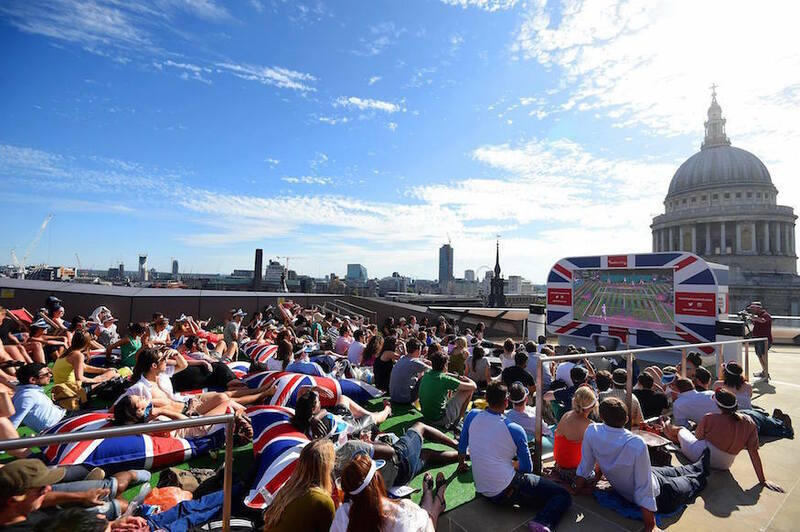 Where better to watch the action than on a rooftop overlooking St Paul's Cathedral and the City of London? One New Change shopping centre opens up its roof terrace to tennis fans looking for somewhere to watch the Championships. If you like big balls, head to Bluebird restaurant in Chelsea where the giant tennis balls are returning, accompanied by a big screen showing Wimbledon. Check the Twitter feed each morning to find out what's being screened that day. The deckchairs are ready at New Street Square, and when it all gets too heated, Snowflake Gelato will be selling ice cream to anyone coming down to watch on the giant screen. 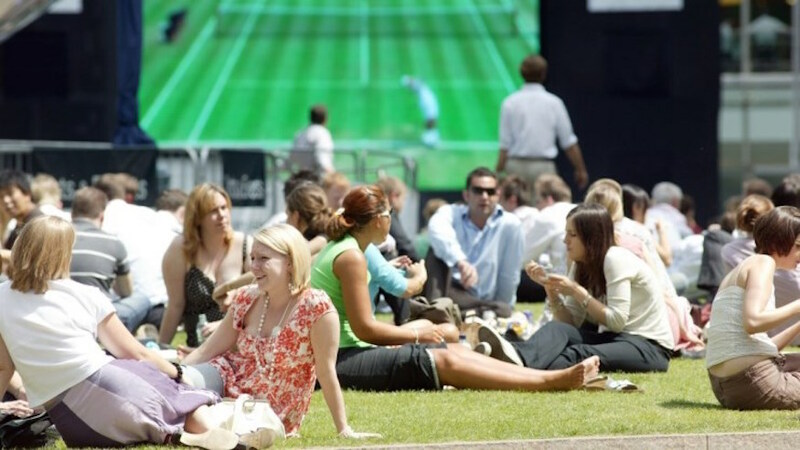 Strawberries & Screen at Chelsea's Duke of York Square will be showing the final weekend of the Championships on 14ft screens, including the Men’s semi-final, Women’s finals and Men’s finals. VIP seating is now fully booked, but you can bring your own blanket or deckchair and watch the action for free. Strawberries and cream will be available to buy, and a pop-up bar will be selling champagne and Pimm's, plus some local restaurants will be offering special takeaway menus. Another rooftop offering, this one at Cardinal Place's roof garden. Alongside the tennis screenings, there's an alcoholic ice tea pop-up bar and artisan food stalls from Shepherd Market. Right in the shadow of One Canada Square, Canada Square Park offers free screenings of Wimbledon. There's no food available in the park, so why not bring a picnic. There are however, plenty of bars and restaurants nearby. Note: glass bottles, glasses, and bringing your own furniture are not permitted. Exchange Square in Broadgate is showing the entire Championships on a massive screen. Pimm's and strawberries and cream are available to scoff, while watching matches at The Scoop at More London, right next to the river. Get close enough to smell Andy Murray's sweat by watching matches at The Piazza in Wimbledon town centre. Deckchairs are provided and Vita Coco will be providing free coconut water. Head to the former London 2012 Athlete's Village to watch the Wimbledon Men's Final on the big screen while relaxing on giant beanbags. There'll also be fairground rides, family-friendly games, and plenty of tasty food and drink on offer, including Pimm's, strawberries and cream and traditional picnics.